Something delicious happened at The Rattlesnake yesterday, but before we get to that, we have something to note regarding our Nacho Avg. Monday reviewing. We’re going to make a little change to rating system for Nacho Avg. Monday: instead of wracking our brains for interesting ways to say “cheese sauce=good distribution,” we’re eliminating the distribution score all together and trial-running a 1-10 “innovenuity” tally (the juxtaposition of innovation and ingenuity). Past Nacho Avg. Monday reviews will be adjusted accordingly. Now, only the business at hand. February 22nd: a beautiful day transitioned into a cold, cold night. BU students, wearing only sweatshirts, were out in force and looking confused. Sad news of a friend left us in a somber mood and ski jumping stole any remaining strand of rational thought we had (how do they get so horizontal!?!?). 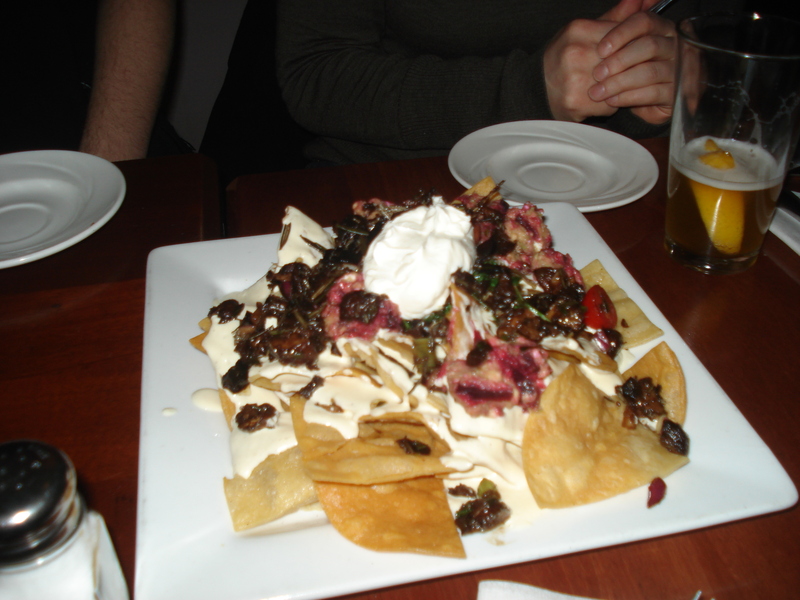 Nonetheless, we persevered, excited to try a nacho sporting two of our fantasy ingredients, brie and mushrooms. The fare: Arugula and spinach gently tossed in grilled portobello and truffle viniagrette–grilled crimini & tear drop tomato salsa, basil and garlic cheese sauce, brie cheese crumbles & jalapeno citrus roasted beet guacamole. Appearance: (9) Look at those colors! We credit the beets and tomatoes for the amazing color palate Mr. Poe presented us with tonight. After all, how often do you see the wonderful creamy purplish pink of beets on your nachos? Splashing in a fleck of green from the spinach and arugula and the pop of a few cherry tomatoes, it was a great (and delicious) change from the traditional dark reds and yellows. Quality: (8) The cheese sauce actually tasted different than normal (and by that, we mean it had a taste). We loved the juicy, rosemary-suffused mushrooms, which served as a meaty stand-in for the usual carnivorous main ingredient. The beet guacamole was hearty and delicious, providing a chunky guacamole texture with a fresh yet earthy flavor. Innovenuity: (9) Who knew you could turn beets into guacamole? What’s next, water into wine, lead into gold? We loved this unexpected take on a beloved food. Beet alchemy! Our one complaint: a large, completely unnecessary dollop of sour cream on top of the whole thing. We aren’t huge fans of sour cream in general, and especially on top of nachos, where it hampers distribution and masks all the other flavors. On these nachos, it was especially unwelcome and cloying, leading us hope that it was placed there by accident, not on purpose. Overall: 26/30. Unexpected, innovative, and delicious. What more could one ask for?